Improved washing, improved laundry care, the Dynamic Next range of advanced, easy to use washer dryers combines all the features of a Hoover washing machine with the convenience of a dryer and offers a choice of practical, large capacity laundry solutions. The WDXOA596FN offers a spin option of 1500rpm plus all the advanced features of our Dynamic Next washing machines, including the Intelligent Wash System and sensor dry technology to give you the best wash & dry ever with the minimum of effort. Hoover washer dryers come with an A energy rating. All Hoover washer dryers also have A rated spin class and A rated wash class. The start delay function allows you to launch a wash programme at a time that suits you. You no longer need to be at home to manage the laundry. All Hoover washer dryers come with three rapid wash programs- 14 minutes, 30 minutes and 44 minutes. This gives you the option of a quick wash to suit your needs. One Touch, the connection system with NFC technology keeps the state of your appliance under control for maximum efficiency and best results every day. Simply by downloading the Hoover Wizard App and placing your smartphone on the appliance, you can expand your washing horizons and the most suitable type of washing for your needs. 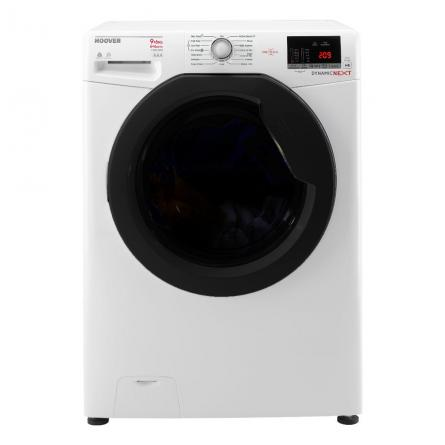 The WDXOA596FN features KG Mode which is a function that weighs the laundry within the first 4 minutes of the program, adapting the water, energy consumption and time of cycle with a scientific precision.